Gardening is a soul-feeding activity for us. We nurture and care for our flowers, vegetables and trees by watering, weeding, and feeding them. Many of us even talk to them. Many studies have been done to demonstrate how plants react to our voices. When spoken to in a soft and soothing voice, the energy around the plant expands and brightens. The plant will even lean towards the voice. When spoken to in a harsh voice or approached in a threatening way the energy field around it will shrink, the color of the plant will change and lean away from the perceived threat. What kind of Gardner are we to our inner gardens? Do we cultivate kindly? Prune with patience? Encourage and appreciate our flowering? There is no other flower like us. We are unique and beautiful, worthy of the finest care. Our compassionate inner self allows us to bloom more readily and more exquisitely. By allowing the image of a flower to come into our minds we make it part of us that is thirsting for appreciation and care. See yourself being watered from a beautiful pitcher. 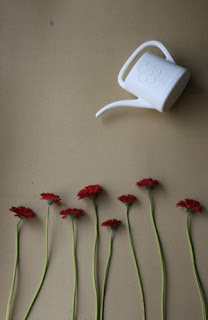 Imagine your flower lifting its head to accept the refreshing sprinkles. Feel its to your roots. Be thankful for as you absorb the sustaining and empowering water. Soak in the sensation of being nurtured and encouraged to grow. I compassionately tend my inner garden. Limiting beliefs and actions from my life. I bring into my world. SO TRUE, YOU ARE ALWAYS SO GOOD WITH WORDS,WHAT A BEAUTIFUL FLOWER YOU ARE, HAVE A GREAT WEEK!! !